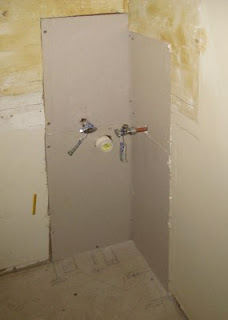 In my last bathroom remodel post, I showed you the progress I made on re-taping the drywall seams over the shower stall. Dan has the harder task, as he's been working on the plumbing. Since we're installing a corner sink, some reworking of the plumbing was necessary. 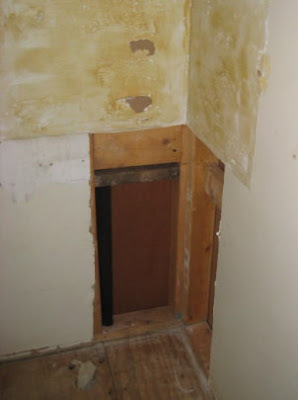 The above photo shows what it looked like after the original sink was removed and the drywall cut away. If you look closely, you can see small holes in the floor where the original plumbing was, just front left of the black pipe. That black pipe is the vent stack. The white PVC is the new drain. As per building code, it has been tied into the vent stack 6" above the height of the sink. 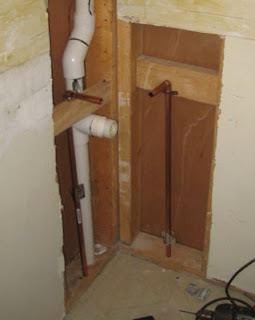 The next step was to install copper tubing for the hot and cold water supply. He went with copper for two reasons: 1 - all the supply lines in the house are already copper and 2 - the jury's still out on whether or not PVC pips can leach harmful chemicals into supply water. 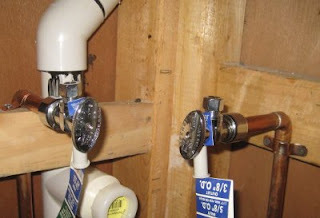 Then he installed shutoff valves to both supply lines and for the toilet. When we bought the house, the only shutoff valves were in the crawlspace. Very convenient, eh? (I'm being sarcastic). After the new valves were installed, he went back into the crawl space, hooked everything up, and tested for leaks. The last step was to cover the cutaway with drywall. I don't have to worry about taping and smoothing out those seams. We're planning to put up wainscoting, which will hide that. 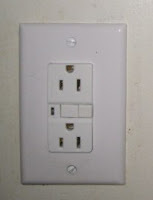 The other thing Dan did, was to install a ground fault circuit interrupter (GFCI) outlet. 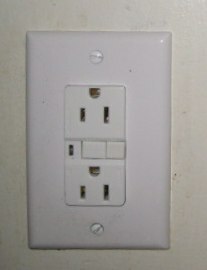 Much of the home's wiring was updated when the addition was built on to the kitchen, but regular outlets were used, so we changed this one. The next step is to reroute some of the drainage pipes under the house. 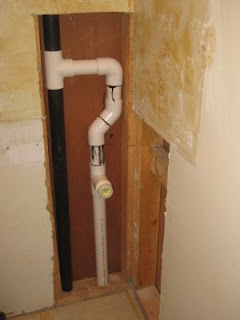 Partly this is to make it easier to move around in the crawlspace, but also, we plan to install a greywater system for the sink and shower water. While Dan's been working on that, I've resumed work on the bathroom interior: painting the ceiling, wallpapering, and putting the floor tile down. After that, Dan can put the toilet back (removed to give us some working room), and install the new sink. Once we get to that point the bathroom will be fully functional! We'll still have a few details to finish (robe hooks, towel racks, medicine cabinet, storage, window treatment, etc), but after that, I'll be able to show you how the finished room looks! I'm looking forward to that. You'll be done before you know it, with a sharp looking bathroom as a results the hard work. Ooo! I can't wait to see it - and I'll bet you can't wait to get it done. I LOVE your greywater plan! Every time I get into my shower I wish I could be watering my garden. sigh! I believe we have some rule/law here that says that we are not allowed to collect our greywater here...I know it was mentioned on the news when we had our drought. As you can imagine folks were highly upset. Your bathroom progress is looking great! Great job! In due time you'll, then see the fruits of hardwork.. Awesome! I have a "difficult" relationship with plumbing. I hope Dan has an easier time of it than I seem to! When doing home remodeling, being able to actually SEE some progress (even if it's not finished!) is so wonderful. Gives ya the strength to carry on! I'm especially eager to see your paint and wallpaper. I have a feeling it's going to be lovely. Hang in there . . . you're closer than ever! Well ya'll. Blogger ate my replies with an error 503 service unavailable message. Rats. Let me try again. Bety, I'm certainly ready! Especially after having this room largely unusable all summer long. Renee, thanks. I think you're right about anti-greywater laws in your state. It's a shame too, because the latest research pretty much throws the original reasons for such laws out the window. Bathroom Tiles, thanks! And thanks for stopping by. Laura, that would be me too. :) Dan doesn't seem to mind the plumbing part, it's the crawling around under the crawl space that isn't his favorite thing to do. He really wishes we had a basement! Oh my goodness- that is bringing back some memories. I have done more plumbing like that than I care to remember. And sheetrocking, and wallpapering. and tiling, and painting and on. It will be so nice to have it done, for certain. Doesn't it seem that the drywall and plumbing take the longest. The project will just fly along from here. Any local codes concerning grey water? The plumbing looks great, is that outlet upside down? Kimmen, I look forward to the day when I can be like you, looking back at it all as only a memory! Nina, I certainly hope so. You've recently finished a bathroom remodel, so I'll take your words as the encouragement of experience. Theresa, we have neither local nor state codes restricting greywater use. And about that outlet, it does look upside down, doesn't it? The writing on it ("test" & "reset") is right side up though. I do have to tell you that to me, all the outlets in the Southeast are upside down. It's been that way in every house we've lived in, in several states. To this day I go to plug the vacuum cleaner in, only to have to turn the plug upside down. No telling why they do that!